You can also reach us by filling out the form below. In the drop down box select the type of event or function you are considering to host at our world class facility. Once you have completed filling out the form please press the SUBMIT button. One of our expert event associates will contact you as soon as possible. Please share with us what your needs are and any preferences you have in mind. One of our Sales Executives will reach out to you as soon as possible with a customized response. We thank you for your interest in Old Mill Toronto and we look forward to working with you on your next meeting or event. You can also reach us for questions regarding your meeting or event at 416-207-2008 or email us at bstarace@oldmilltoronto.com or by filling out the form below. Would you like to arrange an appointment? For inquiries, feedback and/or suggestion please email us or fill out the form below. To book a room, please call 416-232-3707 or 1-866-653-6455. Please share with us what your needs are by completing the form below. One of our Catering Executives will contact you as soon as possible. 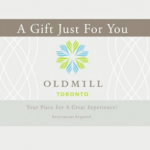 We thank you for your interest in Old Mill Toronto & we look forward to providing you with a unique experience. Please fill out the form below or call 416-236-2641 for more information. For more information we can be reached at 416-207-2020 or diningroom@oldmilltoronto.ca. For more information we can be reached at 416-236-2641 or info@oldmilltoronto.ca. Please call 416-233-1275 to book your appointment. Fill out the form below or email us at flowershop@oldmilltoronto.ca for inquiries. For Spa reservations please call 416-232-3700 to book your appointment. Otherwise, fill out the form below or email us for inquiries about our services, or for feedback and/or suggestions.